Becca joined Cohn Financial Group in 2014 in an administrative support role. Her position involved interacting with marketing, service, and underwriting – all of which gave her a unique vantage point into the various operations of the company. Due to Becca’s intellectual curiosity and strong work ethic, she was promoted to Client Service Associate in 2016 and again to Senior Client Service Analyst in 2018. Becca volunteers for the most complex and detail-oriented tasks and is constantly redesigning tools and workflow. Though many of her biggest contributions involve systems behind the scenes, clients and advisors certainly appreciate the rapid responses and reporting capabilities she provides. 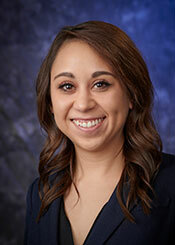 Becca holds FINRA Series 7 and 66 securities licenses and is a registered representative of M Holdings Securities, Inc. Born and raised in Arizona, Becca graduated from Arizona State University with a Bachelor of Arts degree in Biology. She describes herself as an avid reader and movie enthusiast and loves being outside, preferably on her way to go camping or running.